As a child, in the 1920s, my mother contracted polio. It left her with little in the way of the muscle at the base of her right thumb, and her right calf muscle was much smaller than the left. At about the same time my friend Dorothy (who fairly obviously wasn’t my friend at the time 🙂 ) also contracted the poliomyelitis virus. She was much more badly affected than my mother and spent some months in hospital in an iron lung. Neither mum nor Dorothy spoke much about their experiences & I really only gained a sense of what things must have been like when I read Jean Opie’s affecting book Over my dead body. Polio was first described as a disease affecting children back in 1789, by English doctor Michael Underwood, although reports of similarly crippling diseases go back much further. The first epidemics were reported in Europe in the early 1800s, and these recurred every summer & autumn in Northern Hemisphere countries for over 100 years. At its peak in the US, in 1952, over 21,000 people suffered from paralysis due to the polio virus. Researchers think that, prior to this epidemic phase, polio viruses were probably endemic in the human population. Infections were probably first picked up in infancy but could easily be handled by antibodies passed to babies across the placenta; frequent exposure kept the immune system primed. Once the idea of things like flush toilets and frequent washing caught on, rates of exposure dropped & age of infection increased. What’s more, because individuals were less likely to encounter the virus, natural exposure was no longer enough to boost immunity, so that the pool of susceptible people steadily increased, providing ideal conditions for epidemic spread of the virus. (So much for the common anti-vaccination claim that careful attention to hygiene reduces the occurrence of epidemic infectious diseases — in the case of polio improved hygiene actually enhanced the impact of infections. Poliomyelitis is caused by an enterovirus — a virus found in the digestive tract. Because it’s not affected by acidic pH, it can be ingested & passes through the stomach without being destroyed. Once ingested, the virus enters cells in the mouth, throat and gut, and affected individuals shed virus in their faeces before they actually get ill. From the cells of the gut lining, the polio virus moves to the lymph glands and blood, and from there can go on to attack the brain and spinal cord (known collectively as the ‘central nervous system’. Here, as the virus particles replicate, they destroy nervous tissue and this produces the typical symptoms of paralysis. Depending on which areas of the brain and nerve cord are damaged, this can be as ‘mild’ as my mother’s illness or as serious as that which saw Dorothy in an iron lung, with the machine forcing air in and out of her lungs because her diaphragm and the muscles of her ribcage no longer functioned. On average, for each person paralysed (to a greater or lesser degree) by polio, there are 200 asymptomatic carriers, who can still shed the virus and so potentially transmit it to others. Around 4-8% of those infected have fairly minor, non-specific illness: sore throat and raised temperature; general gastrointestinal upset (although actual diarrhoea is rare); and a generalised flu-like state. Apparently you can’t really tell these from illness caused by other viruses. Another 1-2% of people may go from these non-specific symptoms to something called ‘non-paralytic aseptic meningitis’, with stiff neck, back, & legs, and are fortunate in that this clears up completely after 10 days or less. In other words, less than 1% of polio infections lead to some degree of actual paralysis. (Of those affected, the death rate is 2-5% for children, and rather higher at 15-30% for adults.) This can be accompanied by changes in reflexes and by severe muscle pain. The paralysis can last for times ranging from days to weeks (or months, in Opie’s case) before muscle function begins to return. Usually it’s ‘just’ the motor nerves that are affected; patients’ sensory perception doesn’t alter and — once past the feverish stage — they remain alert throughout. Something that must be particularly awful for those suffering from complete paralysis. Opie recounts how, until the nurses managed to sort out the ‘breathing’ rhythm of her iron lung, she could communicate only by winking. Polio epidemics were a regular occurrence when Dorothy and my mother were young. They led to the closure of schools and other public facilities as communities tried to reduce the odds of their children being affected — not for nothing was the disease known as ‘infantile paralysis’. 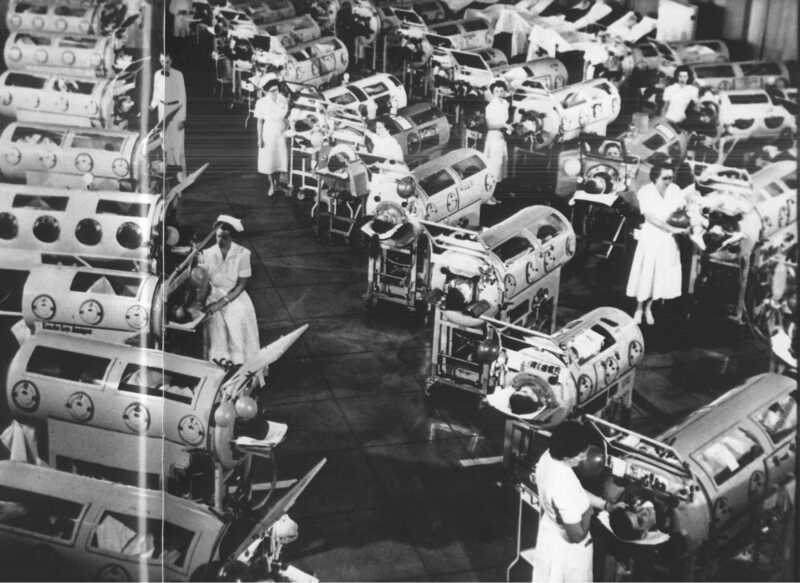 Today polio and the swathe it cut through the population is pretty much a memory for the older generation and today’s parents and young people probably have little concept of what it was like; the days of ranks of paralysed patients encased in iron lungs are long gone. And this is due to vaccination: polio was eradicated from North and South America by 1991. Similarly the Global Polio Eradication Program has significantly reduced rates of polio infection in the rest of the world: by 2008 there were only 1655 confirmed cases globally. Polio remained endemic in four countries — due partly to difficulty with reaching the target groups for vaccination, but also to resistance to vaccination per se. In one of those countries, Nigeria, resistance to vaccination was driven by claims that behind the polio vaccine is a Western-driven plot to spread HIV through the population. Fortunately this has since been turned around. Doubtless some will claim that since polio affects ‘only’ 1% of those infected, and in any case is pretty much gone from Western countries, it’s not something we need to worry about. Which reflects a) a worrying lack of concern for those less fortunate, b) no apparent consideration for the social and medical impact where individuals are affected by the paralytic form, and c) little recognition of the fact that if immunisation rates were to drop, this disease would make a comeback. Food for thought. It’s interesting to note the differences in attitude between the generation of our parents and new parents today. Vaccination is a no-brainer to those who witnessed the ravages of diseases like polio (and felt the fear of infection). Today’s parents see none of this (excepting the recent meningococcal B epidemic) so it is harder to get the immunisation message across and easier for the vaccine-deniers to sow doubt. I was fortunate enough to be vaccinated against polio before I was exposed. My mother had polio too and has very limited movement in her left arm as a result. She actually met June Opie many years later and realised that compared to June, she’d had a relatively ‘lucky’ outcome. When anti-vax types try to deny the existance of polio, then and now, we see just how utterly sweeping and disengenous they are in their quest to promote childhood illness and disease. It’s very hard for sane people to understand!